This Property is 100 Pct. Non-Smoking The Hampton Inn Salem EastElectric Road hotel is located adjacent to the Lewis-Gale Medical Center/the areas largest hospital/ 10 minutes from downtown Salem and 20 minutes from downtown Roanoke Virginia. We are convenient to major Salem industries and 1.5 miles from the Salem Civic Center Complex and Sports Center. Tanglewood Mall is 6 miles south of the hotel and Valley View Mall with over 70 stores is 8 miles north east near the Airport. Within walking distance to the hotel guests can dine at Subway Humble Pie Pizza or Szechuan Chinese Restaurant. There is also a 24 hour Kroger Food Store and CVS Drug Store directly across the street. 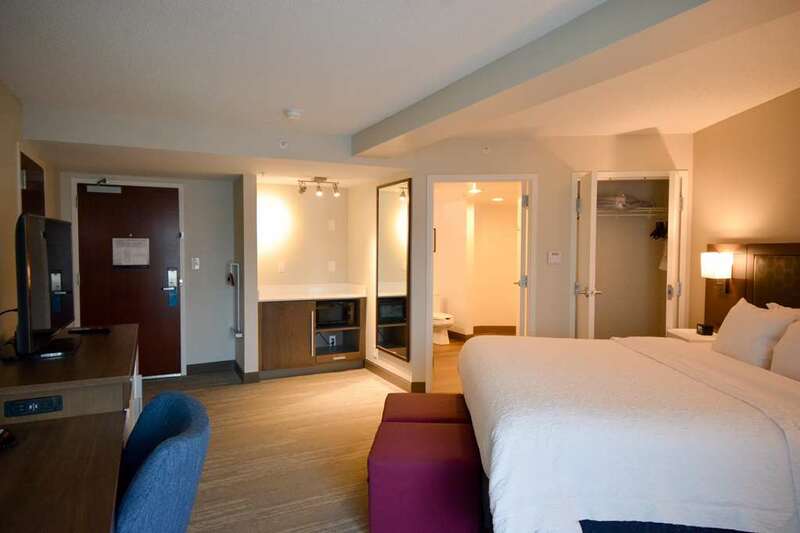 The Hampton Inn Roanoke/Salem features 6 stories exercise room one and two-room suites /some with whirlpool tub/ a well equipped business center and outdoor pool. Whether traveling to Roanoke on business or pleasure at our Hampton Inn hotel guests will enjoy amenities which include Hampton*s On the House hot breakfast in-room micro-fridge single cup coffee maker hair dryer 32* LCD flat screen TV pay-per-view movies HBO two phones Hampton*s Cloud Nine bedding complimentary wireless high-speed Internet and voicemail. Dry cleaning services and guest laundry are also available at this location. We love having you here. Mac and Bobs: A Salem Favorite. Casual dining. Sports bar and outside dining available. Across from Roanoke College. Michele*s on Main: Fine Dining. Steaks Seafood and Chicken. Szechuan Chinese: Rated 1 in Roanoke Valley. Directly across from the hotel. SUBWAY: Across the street from hotel. Pancake House: Traditional booth and counter service. Breakfast Lunch and Dinner served. Located 1 mile from hotel. Humble Pie Pizza: Across the street from Hotel. Specialty pizzas salads and sandwiches. Pizza Pasta Pit: Great brick oven pizza. Excellent sandwiches. Only 1/4 mile from hotel.